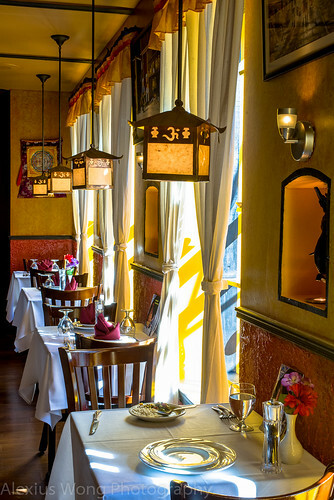 I have had my fair share of Indian food, either during my youth growing up in Southeast Asia, or the Indian food establishments that I’m always seeking out to find good authentic Indian fare. So, when a coupon for Nepalese cuisine popped up on my computer screen, there was no hesitation pressing “enter” to purchase this deal, having in mind that this South Asian cuisine could be fairly similar and at the same distinct from the aforementioned cuisine. 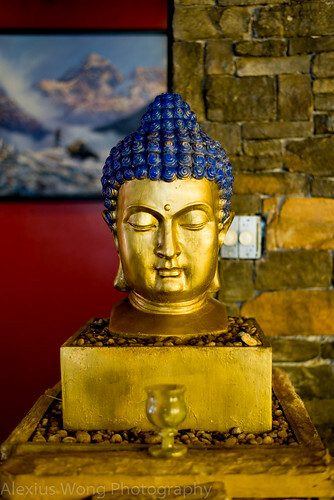 I showed up at Himalayan Heritage in Adams Morgan, D.C., with coupon in hand, to later find out that it had just passed the expiration date for such deal. Walking through its door, I entered a familiar space that held a former life and cuisine (that restaurant and its type of food escape me), and I was immediately impressed by the rich and exotic decor that whisked me to the Himalayan highlands, with a bright autumn light flooding and illuminating the rich painted walls within. Since the paid value for the deal was still valid, I sat down and looked at the menu with a certain degree of enthusiasm and culinary curiosity, having not ventured in this gastronomic field before. Immediately after taking my seat by one of the well-dressed windows, a waiter put down in front of me a plate of soybeans and puffed rice. After perusing the menu and placing my order, I took my first bite of this opening dish. The soybeans were a bit firm, an indication of being freshly cooked, tasting slightly salty, spicy from some chili heat, slightly sweet from the onions and red pepper, and yellow from some turmeric. 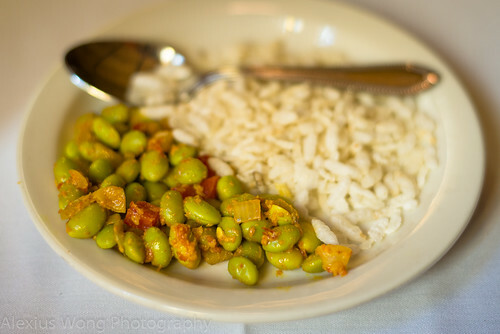 This was an indication of what I could predict what Nepalese food was about – rather simple and not overspiced. The puffed rice was a playful counterpoint to the green beans, being flavorless but slightly nutty. An order of Mango Lassi as my drink was a pleasant surprise from the usual expectation, it being not too thick, not too sweet, and the mango puree fruity and not metallic (the result of canning), exuding some slight floral notes. A good start. 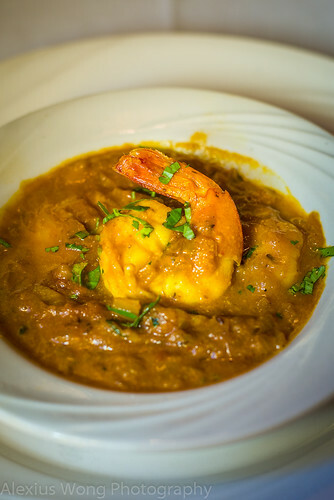 I decided to go for the five-course special in order to sample as many dishes as I could in this one sitting – the mango lassi, glass of wine, or beer made up the first element. 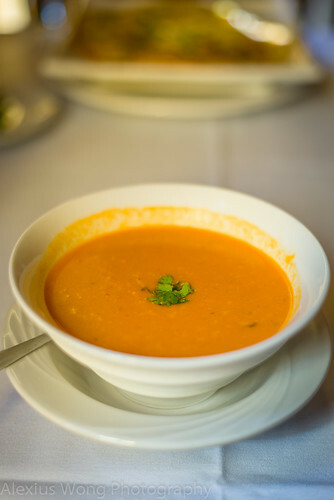 The next course was a choice of soup or salad, and I went for the Coconut Tomato Soup – unfortunately, I could not substitute this course with the famous Nepali Momo, akin to Chinese dumpling. The large bowl arrived with a waft of coconut essence emanating from the orange hot liquid, forecasting what to expect with each spoonful. It was an interesting combination of Indian Sambal soup with its sour fragrant notes, slightly fruity from the pureed tomato, and rich from the coconut cream and toasted coconut bits in it. Each spoonful was a layer of my gastronomic research as my curious tongue probed each mouthful. I eventually had to place my utensil down as I was started to feel quite full from this hot soup, and I had to leave room for the rest of the meal. It was tasty and interesting, but I would have preferred as smaller bowl of this rich sip. I was taken aback when my next course arrived. The Stuffed Chatamarin looked like a huge pizza with a topping of different colorful ingredients. One mouthful revealed its true nature. The dough was a spongy rice flour base that was completely mild and lightly seasoned, sans the gluten pull, and made yellow with the use of turmeric. Studded through it (not toppings, but cooked as part of the dough mix) were pieces of green onion, red peppers, white onion, bits of ground chicken and a whole egg cooked as its center. 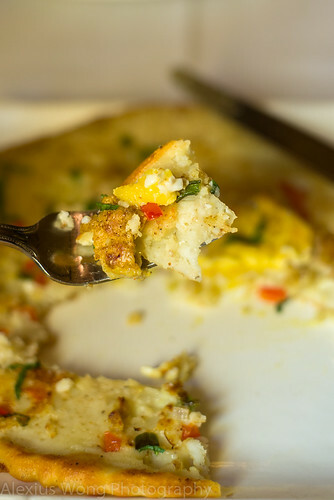 The disparate elements came together in each bite, with the rice dough providing the mild backdrop, the vegetable bits fragrance, the chicken its meatiness and some good seasoning, and the over-easy egg its rich yolk creaminess. Just like the above soup, each bite was whetting my curiosity, but I had to stop my probing venture into this dish when nearly half had already been consumed. As for the next two courses of the super meal, the choices were served as half orders, and understandably so. The first medi-portion was Nepali Style Tarkari. My order came with 3 large shrimp, butterflied and cooked perfectly, just done without any bounce in each bite, and tasting fresh and seafood sweet. The sauce was quite salty (which I didn’t mind once mixed with rice) but slightly sweet from the tomato base, fragrant from onions, ginger, cumin, and a little spicy from some chili. Obviously, someone in the kitchen knows what he (I did see Mr. Chef) is doing with such skilful handling of the elements especially the star protein in this dish. The side of Basmati rice was properly cooked, being light and fluffy, slightly oiled, and studded with some flavor-exploding whole cumin seeds. The other half portion was Asparagus Bhutuwa. 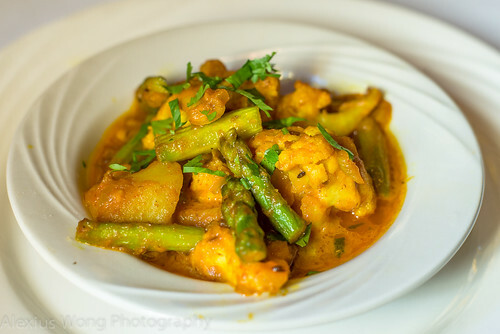 A bowl was filled with cauliflower, asparagus, and chunks of potato, covered by a orangy sauce containing some fragrant cumin seeds. But what impressed me the most was the cooking of all the different vegetables: the cauliflower completely cooked without being mushy, the asparagus tasting fresh with a slight crunch, and the potato completely cooked and disintegrating in the mouth with ease – such cooking needs perfect timing. The sauce was slightly sweet with a hint of sufficient spice heat, and a tinge of sourness to complement and add some more interest to the whole mix. This was a most satisfying and worthy vegetarian/vegan dish. 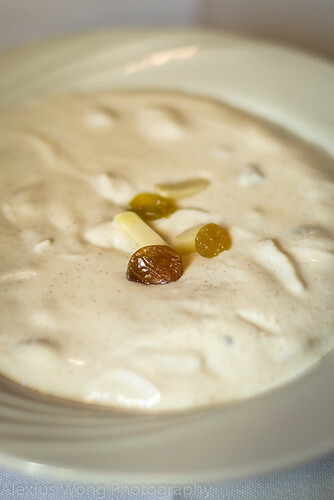 Dessert was the final course, and while perusing the menu, I shied away from the usual Indian suspects and honed in on a Nepali sweet dish: Sikarni – Spiced Sweet Yogurt Pistachio. The bowl arrived with thick full-cream yogurt studded with bits of nuts and sultanas. The first mouthful woke this diner up with its use of cinnamon that not only provided some zing but also a bark-like fragrance from the fresh-tasting spice. The nut-fruit element did not come across as an afterthought in this dessert since they were quite soft from a long sitting in the mix, having absorbed the slight tanginess from the fermented milk. The sugar level in it also pointed to a judicious hand that was skilful in providing the perfect balance. My only complaint was the lack of fragrant pistachio as listed in the menu, but this dessert was already chockful with nutty slivers of almond. Even though I was quite stuffed from the previous courses, I found this sweet ending very tantalizing and completely irresistible, and despite its richness, I simply could not get enough of this cold sweet fragrant yogurt. Despite not being able to capitalize on the coupon deal on time, I was most impressed by my trip to this restaurant serving a little-known cuisine in this area. I did walk in with some preconceived notions of how the food was going to taste. But what I came out with far outweighed those ideas as the dishes left me with a big smile from a sated stomach and my pleased gastronomic senses; the interesting rich coconut soup, the tasty and intriguing rice dough “pizza”, the perfectly cooked shrimp curry, the equally stellar and perfectly cooked vegetables in a spicy sauce, and the mild yet no-less-satisfying yogurt dessert. 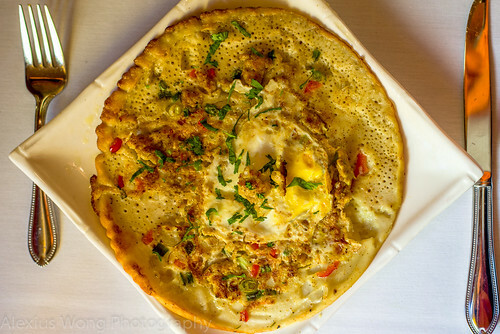 Yes, it did take some effort finding these Nepali offerings amidst the sea of Indian fare, but the effort paid off handsomely. Never mind I did not get to order the Nepali Momo dumpling. 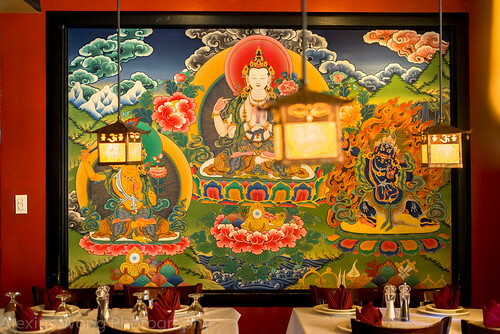 What made up for it was the well-executed dishes that whisked me away to another place, aided by the lush décor around me, and the next table of Nepalese enjoying the dumplings themselves. From this dining experience, I think I have found a new cuisine that I have quickly fallen for.